Choose VT 2130-3132 if you need a system to extract hot, humid air from your home (from 200 to 300 m3/h) and use the energy recovered to produce sanitary hot water. 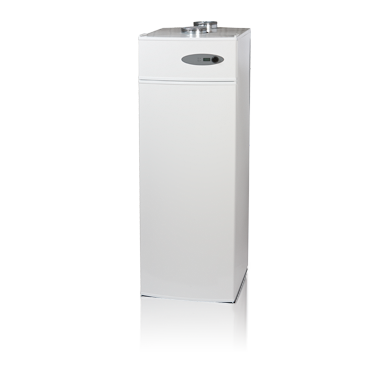 The VT 2130-3132 range is for anyone who needs extraction with highly efficient heat recovery and sanitary hot water production. The systems extract hot, humid air from e.g. the kitchen, bathroom and utility room, and at the same time remove dust particles, moisture and odours from the home. The energy recovered from the extract air is used to produce sanitary hot water. The VT 2130-3132 range uses only one third of the energy that a traditional water heater uses to produce sanitary hot water. The systems are equipped for connection to another heating system, e.g. gas or solar power system. The VT 2130-3132 systems have low energy consumption and a long useful lifespan. They are cheap to install and take up no more space than an ordinary tall cupboard. They can extract from 200 to 300 m³ air per hour and are suitable for locating in a utility or technical room.